Add a classic, yet updated, feeder to your bird sanctuary with the Droll Yankees A-6 Ring Pull Bird Feeder. This innovative feeder uses the classic design of a traditional armored tube feeder with reinforced ports, and combines it with a quick release and disassembly mechanism. Silver colored metal surrounds each of the 6 seed ports, and a perch rests beneath each one for birds to sit and dine. This reinforcement prevents squirrels from chewing on the ports, enlarging them to pilfer seed. A clear plastic seed tube holds 0.95 quarts of safflower, sunflower, or mixed seed, and the baffle design directs the feed to the bottom ports so that the feeder empties completely. Drainage holes help the food remain dry and fresh, and the silver colored, metal cap protects it from added moisture. A metal rod threads through the center of the feeder tube keeping all ports intact. When it is time to clean the item, simply pull the metal rod out using the ring at the top. Each of the ports will fall out of the feeder, for thorough and easy cleaning. Assembling the item requires no tools, with the handy interlocking port design and guide holes for each perch. 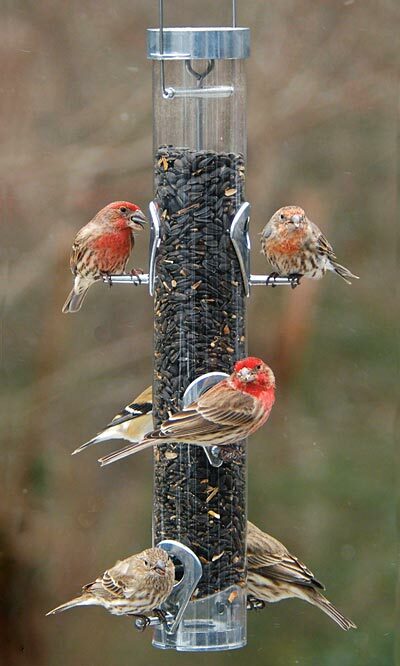 The sturdy metal cap slides up the attached hanger for refilling the assembled feeder, and the durable construction will faithfully serve your birds for several seasons. Use the metal loop to hang this feeder from a hook, or pole mount it with the 0.75" threaded port on the base. Perfectly combine traditional and modern elements in your bird garden with this A-6 Ring Pull Bird Feeder. Made in the USA. Lifetime warranty.